This past spring, food giant Goya partnered with BRIC to generously sponsor the exhibition, Bordering the Imaginary: Art from the Dominican Republic, Haiti, and Their Diasporas. In conjunction with sponsorship of the show and as part of the company’s Goya Gives initiative, the popular food label proposed working with BRIC to facilitate an artist residency at the Orfanato Niños de Cristo orphanage in La Romana, located on the Dominican / Haitian border, and founded by Henry Cardenas and Marc Anthony of the Maestro Cares Foundation. 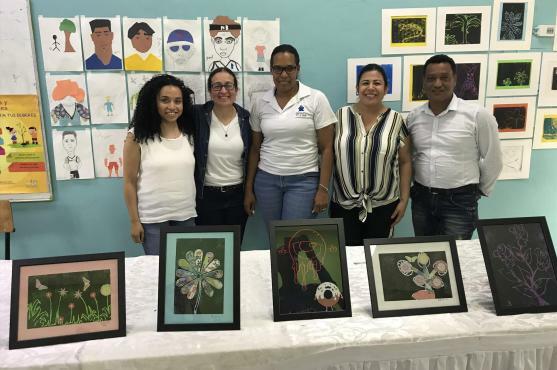 Bordering the Imaginary exhibition artist iliana emilia garcía was selected to travel to the Dominican Republic to provide a series of art workshops at the orphanage. BRIC’s Contemporary Art Program Manager Sol Nova accompanied garcía on the trip, and helped out with the workshops she provided to 25 orphaned kids interested in art, ages 10-18. Here, Sol talks about the trip and her experience helping the youngsters at Orfanato Niños de Cristo create art.